Our image of the month for June 2018 is the globular cluster Messier 107 (M107, or NGC 6171). Located in the constellation Ophiuchus, M107 lies at a distance of ~21,000 light years from Earth. This means that when we observe M107 directly, we see its properties (how it looked) ~21,000 years ago, as that is how long the light has traveled from it to reach our eyes. It was first discovered in April 1782 by Pierre M­échain and also independently by William Herschel in 1783. 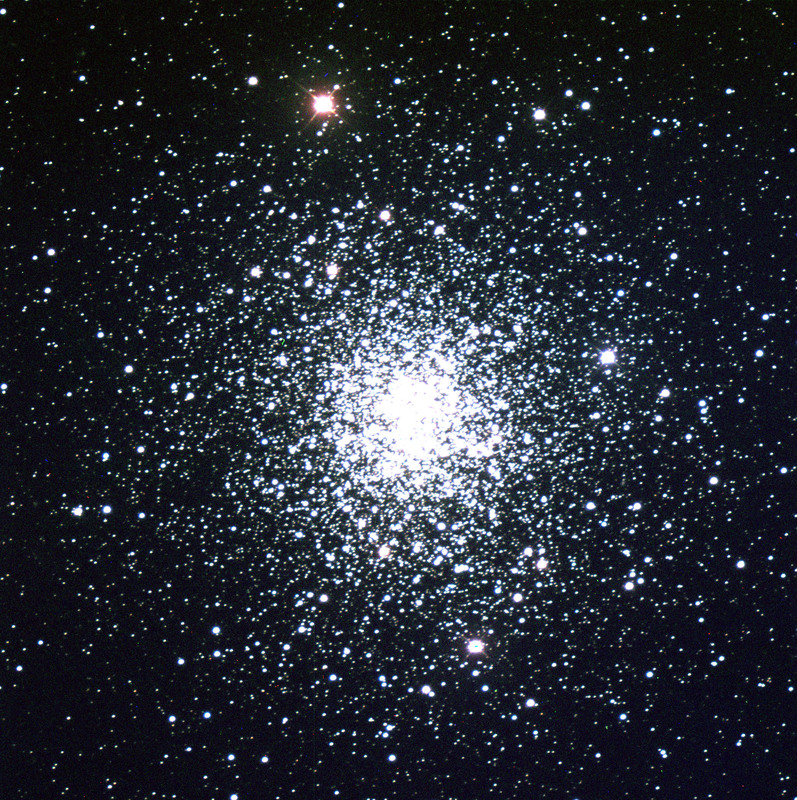 Globular clusters are dense stellar populations home to - in most cases - hundreds of thousands of old stars which are high in metallicity (that is, harbour heavier elements). The sheer number of stars within a globular cluster system is so large that the system is gravitationally bound; the gravitational pull from all of the stars collectively hold the system as one structure and one would have to apply a generous amount of force to remove a star from the system. The concept behind the shape is not too dissimilar to elliptical galaxies in that they are spherically gravitationally bound. Also see, such as in the case of M107, that the center of a globular cluster is usually a region of very high density where the density then drops off with distance. There are approximately 150 globular clusters discovered to be around the Milky Way's galactic disk, of which M107 is one. The study of globular clusters is extremely important in the investigation of galactic formation, as they are some of the oldest known objects in the Universe with ages of up to 12 gigayears. The study of globular clusters therefore may provide key information in the earliest stages of the formation of the Milky Way.